This is a grab and go type of lunch, you can grab all the single ingredients, and take with you. You can build your lunch wherever you are. Use lettuce leaves as wraps for hummus or cheese and top with sprouts and avo, use radishes, celery, and cucumbers for dipping. 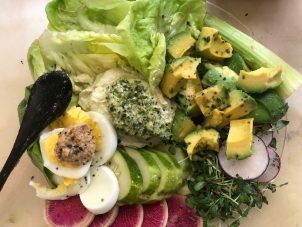 To add flavor, put a dollop of mustard on your hard boiled eggs, salsa or pesto on your hummus or cheese, and lime and salt on your avocado, and a squeeze of lemon or lime over all with salt and pepper to taste. Here is a recipe for Cashew Nut Cheese. Here is a link for several different types of hummus.